Whew, Happy Friday Everyone! Part of me is surprised I actually made it - it's been a particularly painful work week. Thank goodness for the weekends. For a while I was working everyday. On Fridays I would think to myself "Oh good, only 2 more workdays until Monday." But that's no way to live. Nowadays, the email gets turned off on Friday after work and doesn't start up again until Sunday night. 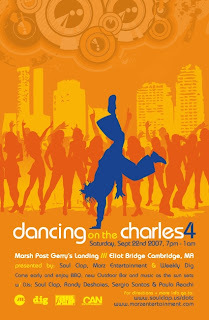 Coming up tomorrow, Saturday 9/22, is the fourth and final Dancing on the Charles event. D.O.T.C. parties are from 7pm-1am and are 21+. There is a $5 cover before 10pm and a $10 cover after that. D.O.T.C. is at American Legion Marsh Post #442 . American Legion Marsh Post #442 is at 1 Gerry's Landing, outside of Harvard Square, Cambridge. 0 Response to "Dancing on the Charles 4 - 9/22"